Take the Eagle Bahn Gondola to Adventure Ridge on top of Vail Mountain in Lionshead. 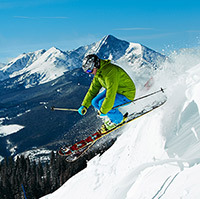 Choose from 5 dining options and many great activities for the kids including: guided snowmobile tours, snow tubing, ice skating, snowshoe tours and rentals, and snow biking. Winter snowmobiling and ski biking are required to have reservations before 5 PM. The gondola is also free after 3:30 PM. Great fun activities and events for the whole family.